Honest reviews, regular hauls and all things beauty. 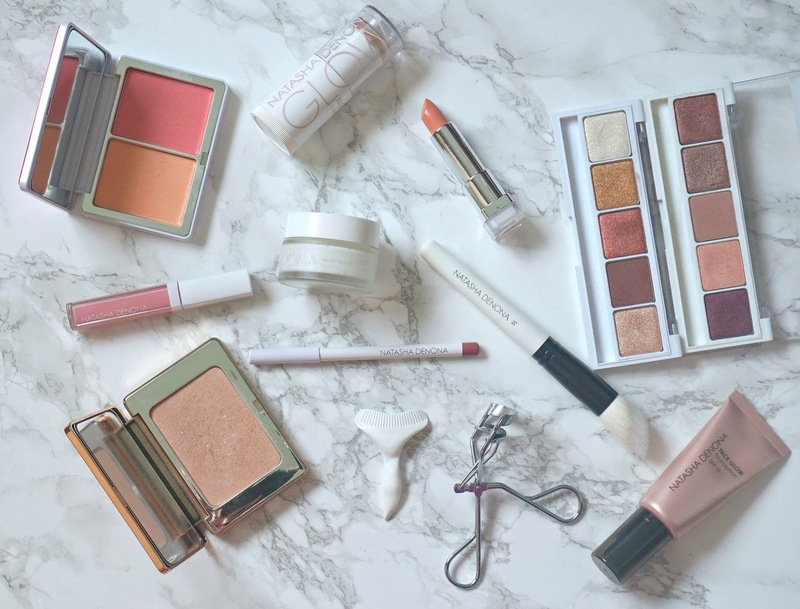 Following on from last month's first brand focus post, I thought that I would choose a makeup brand for my next post to switch it up a little. I lusted after Natasha Denona products for months before Beauty Bay began to stock them and as soon as I tried the first eyeshadow palette, I knew that it was a brand that I wanted to explore more. I don't have the largest collection but have tried enough products to give you an overview of the brand. The packaging is quite simple - I like that it is white, rather than black or gold like a lot of high end brands, although the eyeshadow packaging could do with being a bit sturdier. Natasha Denona is an international makeup artist and I first heard of her when I saw Tati & Jaclyn Hill raving about her eyeshadow palettes and I instantly wanted one but when I saw the price of the 28 pan palettes, I winced! However, when I saw that I could buy a 5 pan palette, I decided that was the way to go - that being said, her shadows are available for individual purchase too but value-wise, it made sense to buy a 5 pan palette. I cannot rave about these eyeshadows enough - they are so creamy in texture, extremely pigmented, long-wearing and they are so easy to work with because they almost blend themselves. They are definitely in my top 3 favourite eyeshadow formulations of all time and I would love to add more to my collection. There are thirteen 5 shadow palettes to choose from and 66 single shadows to choose from in a variety of finishes from matte to duo-chrome to sparkling to metallics and also a blackest black shadow. She has three primers available, depending on what your skin needs. I own the Face Glow Primer Hydrating Underbase, which is perfect for my dry skin. It has a creamy texture that absorbs immediately and really hydrates the skin without any greasiness. My skin feels so soft when I use this and my foundation applies beautifully over it. This is one of the best primers I have ever used and I highly recommend it to anybody who has dry skin. There are three foundations available - again, depending on skin type. I bought the Face Glow Foundation because there's nothing I love more than glowing skin! Armani Hydra Glow was my absolute favourite foundation and I was gutted when it was discontinued. Since then, I have been searching for a similar base and this is pretty close. It has an almost gel/cream like texture but it feels weightless on the skin. The coverage is medium and it doesn't highlight fine lines or exasperate the pores in my cheek area. It lasts really well on my dry skin and I just love the glowing look that this gives without looking greasy. I already have 2 back ups of this! There are 12 shades of this foundation available. Natasha Denona is renowned for her glow inducing products and there are three highlighters in the collection - a liquid, cream and powder. I have two of them - All Over Glow Face & Body Shimmer Powder, which was the first product I bought from this brand and Face Glow Cream Shimmer. I adore both of these products - the powder is very finely milled, which makes it a dream to apply. The pale gold is quite subtle but can be built up without looking too cakey and to really amp up the highlighting effect, it looks great when layered over the cream shimmer. The shimmer is a very creamy texture and when dabbed on to my face, it doesn't disturb my base. It is quick & easy to use and I know that I will get a lot of use out of it during the summer months because I will use it along my collar bone and on my shoulders (roll on summer - I'm writing this with a blanket on my lap in front of an open fire!). I have one blush duo, which although looks very bright in the pan, is actually a lot more subtle on the skin. Each duo contains one dominant colour (on the right side) and a more subtle shade (on the left side). They actually work well when blended together on my medium skin. The texture is quite similar to Nars blushes, which I really like but don't love quite as much as Hourglass blushes, which are my favourite so I don't know that I would buy another one. In terms of lip products, there are lip pencils, lip glosses, mattes, tints, palettes and glazes available so something for all tastes. I have one lip pencil, a gloss and a shiny lipstick. The lip pencil is my least favourite of all of the products I have tried from the brand because it is a little bit stiff for my liking and can feel like it is dragging on my lip liner - I personally prefer a creamier texture. Having said that, it is pigmented and quite good in terms of longevity. The lip glaze, on the other hand, is a really beautiful product because it is non-sticky, pigmented, hydrating and pretty long-lasting for a gloss. I own one lip colour shiny lipstick and the first thing that I noticed about it was the sweet, vanilla scent - similar to MAC lipstick scents, but stronger. The lipstick itself is very pigmented, creamy, hydrating and comfortable to wear - it reminds me of the MAC cremesheen formula, but better, because it lasts longer on the lips. I definitely want to add more of these to my collection. In terms of tools, I have three products - a lash guard, an eyelash curler and one brush. I bought the lash guard on a whim because I hate when I am applying mascara and it smudges on my eye lid or I sneeze (happens so often!!). It is a little bit fiddly to begin with but I am used to it now and am delighted not to have to try to chip my mascara away without disturbing my eyeshadow. The eyelash curler is a bit smaller in size than my previous Shu Uemura one but it is an excellent tool - it really curls my lashes and they hold the curl - probably the best lash curler I have used. The powder shimmer brush is the perfect brush for applying highlight - it is angled and deposits exactly the right amount of product on the cheekbone area. I intend on buying more of her brushes. The price point of Natasha Denona products is a strange one - the 28 pan palettes are extremely expensive at £199/€244, the foundations are similar to other high end brands at £30-£35/€40-€44 but the lipsticks, glosses and liners are priced similarly to MAC, yet I think they are of higher quality. There are empty palettes available and the eyeshadows and lip products are sold in individual pans so you can essentially build your own palette with a variety of products and finishes if you wish. It is a cruelty free brand and one that I want to explore further - her mascara, sculpting powder and, of course, more eyeshadows are on my wishlist! I would also like to try some of her eye brushes because the face one has impressed me so much. I don't think that I have ever built a collection from one brand as quickly as I have with this one, which speaks volumes for a makeup addict like me! The products are available from Beauty Bay Sephora and Beautylish if you want to try some for yourself. Beauty Bay currently have an offer whereby you can receive a free mono eyeshadow metallic in Moonstone if you spend £50 on the brand. As with my previous brand focus post, this post is not sponsored - I just genuinely love the brand! Have you tried any Natasha Denona products or are you tempted to? I would love to hear your thoughts in the comments below! Thanks for reading! Don't forget to enter my luxury fragrance giveaway here! Follow Beautylymin on Bloglovin, Twitter and Instagram for regular updates! All products are bought by me, unless otherwise stated. Opinion is always my own. I really love to read your comments & appreciate all of them! Drunk Elephant Slaai Makeup-Melting Butter Cleanser - worth the hype? Dior Forever Skin Glow Foundation - Worth The Hype? Five thirst-quenching and nourishing masks! My going 'out' out rituals! © Beautylymin | All rights reserved.